Molten has established its name through their dedicated work and close relationship with the governing body for basketball in the world, FIBA. Molten balls are being used in all competition organized by FIBA and some other national competitions. 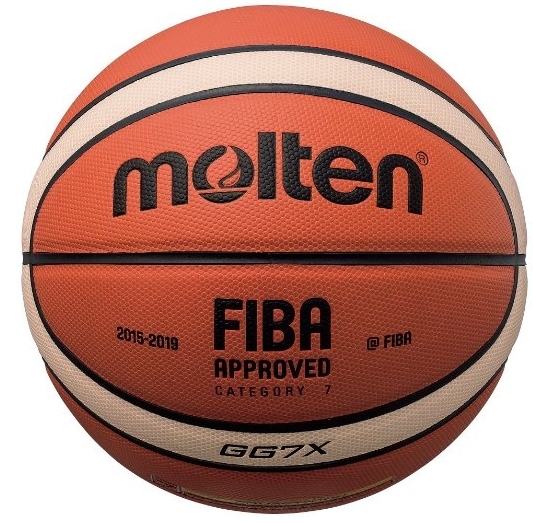 With the seal of approval displayed even on their basketballs, Molten made sure that their brand is recognized by the players. We tested Molten X-Series Composite extensively and compared the results with other manufacturers to get a better grasp of the quality. This model is intended to be used indoors and the first thing we came across is that X-Series really likes to stay away from the outdoor courts. The wear and tear is quite visible even just a couple of sessions of playing on tarmac or other rough surfaces. So, best to keep this ball on the hardwood. One of the reasons this ball is so popular is the Premium Composite Leather cover that surrounds it. The GG7X is extremely grippy and can even be palmed by a player with smaller hands. A dense pebble pattern makes sure that the optimum amount of surface is always in contact with your skin. The other thing that helps the handling is an interesting and a quite unique GIUGIARO design. This 12-panel, multi-color design makes sure that your control is always at the highest level, especially during the shot release. The additional control canals are there to make sure you have a perfect rotation control during the release. The multi-color design is visually effective as it helps you keep track of your rotation. This is really useful for coaches and trainers who work with younger categories. If you can see how the ball rotates, you can make adjustments to your shot and achieve better technique. That results in better short percentage. X-Series feature a Butyl Bladder system that makes sure that every bounce is precise and consistent. We tested bounce rates and the softness of this ball and the results were consistent across all the parameters. Simply put, whenever you bounce GG7X, you can be completely positive that it will have the same response every time. We coupled that with the user reviews around the Web and came to a conclusion that all of them recognized this model to be a superb handling basketball. Competition is stiff in this category and what separates Molten X-Series from the rest of the pack is the price over quality ratio. This is a professional indoor basketball. The price reflects and also justifies all the qualities it has, and regarding the multi-color visual design, it’s up to your own taste.